If you visit the Louvre in Paris (and I hope that you do), skip the puny paintings like the Mona Lisa and seek out the monumental works of Les Orientalistes like Eugene Delacroix. In the words of Baudelaire, "Delacroix was passionately in love with passion, but coldly determined to express passion as clearly as possible." The leader of the French romantic school, Delacroix painted influential works with political themes, including the iconic Liberty Leading the People. His portrait of violinist Paginini is contrasted with that of Ingres in art history classes: while Ingres's is staidly realistic, Delacoix captures the feeling of a Paginini performance. In 1832, Delacroix traveled to Spain and North Africa, where he painted harem women smoking a hookah in the monumental Women of Algiers, a painting admired and imitated by Picasso, among many others. 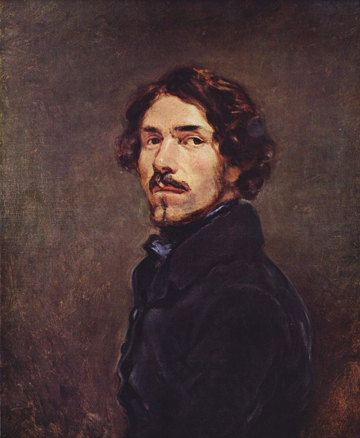 Along with Baudelaire, Victor Hugo and Alexandre Dumas, Delacroix was a member of Le Club des Hashishins in Paris. Delacroix is depicted in the 1991 film Impromptu, where the worthy actor Ralph Brown, playing the painter, smokes a hookah at a dejeuner sur l'herbe. Women of Algiers can be spotted in two scenes.